Can I even be bloggered? Parenting blog dilemmas. Make a schedule and stick to it *Tick*. Use original, striking images *Tick*. Promote through social media *Tick*. Engage with other bloggers *Tick*. It’s a parenting blog, and while the blog part of that is important, it’s not my job. Parenting, on the other hand, is my main job right now! So despite the best advice in the world about schedules and regular posting, if I don’t get time to write some trite little rant about PlayDoh, it’s not the end of the world. 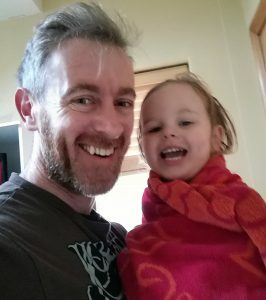 If however, I should neglect my daddy duties in the interests of shouting into the void on my parenting blog… Well that, that is much more like Armageddon to me. If ever the day came where my Instagram distracted me from being the best dad I can to my girl, I would consider myself a failure at doing the thing I love the most. So schedule be damned, if I get the time – great. If not – so what? The world will spin on without my meme being published, the literary canon will not suffer. Far be it from me to judge anyone else’s parenting, I mess up more often than I like to admit. But there are some accounts that are populated by so many selfies of the parent, so many to-camera monologues that I’m sick of seeing their darn faces! Isn’t this parenting blog supposed to be about the kids? Or is it all about you? My worry is that my own might become a similar vanity project, I cringe at the thought. SELFIE: Look,it’s me and Mimi, but most importantly, me! With filters, obvs. Like I say, there are some awesome folk out there. Yet the thought occurred to me one day, and I could not shake it: “Who actually reads a parenting blog? Is it just parenting bloggers?” The wife assures me that she read lots of them while pregnant, and there’s plenty good advice to be had. But out of my modest visitor numbers and engagement stats I had to question whether a chunk of that might be just other bloggers being polite or curious. If so, what’s the point of all this? Call me cynical, but the round-robin of kudos amongst bloggers seems a bit fake to me. I see people calling each other ‘Brilliant’ or ‘Hilarious’ when the former’s grasp of grammar is tenuous, and the latter just stole a meme that’s being doing the rounds for weeks! I know that the support network of fellow bloggers is an invaluable asset to us all, I’ve just not got the time for stroking egos. In my former life as a newspaper editor, the idea of sparing someone’s feelings when they filed shite copy was abandoned early on. Can everyone really think that everyone else is awesome? So while I’m ever grateful for kind and encouraging words, it’s hard not to have them ring hollow sometimes.. Ungrateful, huh? Yes, I’m aware of the irony of a self-reflexive parenting blog post about blogs. Just needed to vent – that’s one of the many purposes of these yokes, no? Normal service (if you can call it such) will resume presently. Thanks for reading. I won’t plead The Fifth on The Eighth: I say Repeal. Guest Post: Meeting the challenges of single parenting. Fire in your auld email address to subscribe to the blog and receive email notifications of new posts. Dada on Can I even be bloggered? Parenting blog dilemmas. kristin mccarthy on Hey, Lady. I do know what I’m doing here! – An open letter. MomOfTwoLittleGirls on Hey, Lady. I do know what I’m doing here! – An open letter. One Messy Mama on Hey, Lady. I do know what I’m doing here! – An open letter. Heather Burnett on Hey, Lady. I do know what I’m doing here! – An open letter. Next Post Values you should teach your children – Guest Post. That’s good advice, Lydia. I will. Thanks for reading. This is a fascinating viewpoint, blogging has to secondary to being a dad that’s for sure, but also blogging has to fun like anything in life we do if you don’t enjoy you won’t do it. Nowadays blogging is still loads of fun for me, but it has also become a source of income which was never my intention when i started but I’m not knocking it. I have always wondered if I’m honest who reads my ramblings but I guess I will never know. Good luck if you continue your blog I have always enjoyed your posts. Almost a year in I have moments like this too. Being a parent always has to come first, for now I write early in the morning before anyone else is up, or after they go to bed. If my youngest is happily playing be herself I may get a bit of blog work done but always stop when she needs me. I’m hoping to turn it into a job so that when she starts school I can work from home and not have to worry about after school clubs and finding cover for school holidays etc as I want to be able to spend that time with them so that’s my motivation to keep going. As a parent of kids who are now adults. I congratulate you on getting your priorities right, spend time with them. It is the most important point of being a parent the second point I would make is be a parent first, not a friend. Friendship follow s when they get older and appreciate why you wouldn’t buy them six huskies! The first six months my blog ran my world. Like I probably should have sought help for my blogging addiction. Good news! I have fought my way back to the world of human interaction and found balance.